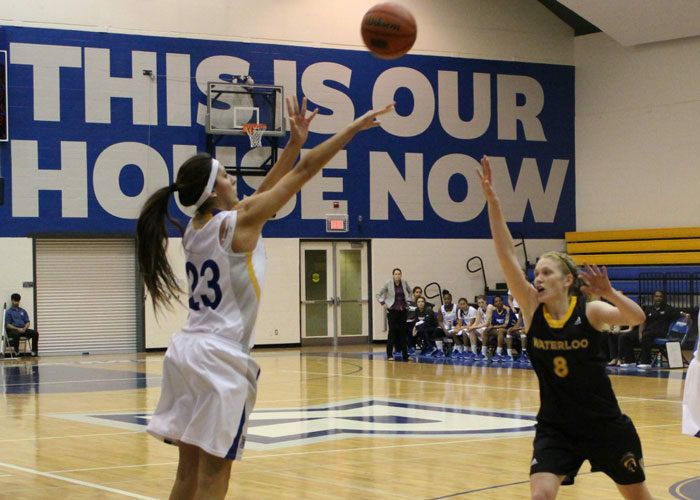 Ryerson students will be watching a basketball-shooting robot at the Canadian Interuniversity Sport (CIS) Final Eight next week. The Ryerson Rams Robotics student team showed off the robot, RamsBot, at Engineering Night with the Toronto Raptors on Feb. 27 at the Air Canada Centre. The event kicked off National Engineering Month across Ontario. The Raptors could have used the RamsBot as they were blown out 113-89 in their game against the Golden State Warriors that night. The RamsBot, designed last month, uses technology similar to tennis-ball machines. It is made up of a hopper for ball storage and a shooter, which moves basketballs through a conveyor to a flywheel that provides the speed and pressure needed to shoot the ball. Marmeto says he’s not sure exactly when the RamsBot will be performing during the CIS Final Eight, but it could be during Ryerson’s first game or in the tournament finals. As for the RamsBot’s future after the tournament, Marmeto says he expects the team to continue to upgrade the robot and perhaps treat it the same as the HitchBot, the Ryerson-created robot that hitchhiked across the country.